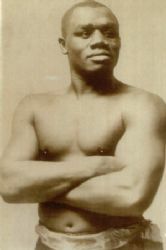 One of many top boxers denied a chance to fight for a world title largely because of racial discrimination that existed during the early twentieth century, Sam Langford was one of the greatest of all time. A fine boxer, he combined skill with terrific heavy punching power, intelligence and courage.Standing only 5"7 he gave away considerable height and weight to opponents but still knocked out leading heavyweights like Fireman Jim Flynn Gunboat Smith and Harry Wills.Had he been white Langford would surely have won at least one world title as he boxed from lightweight up to heavyweight, and beat several world champions. He invariably made little money and often did not get paid at all by the promoters who conveniently did a disappearing act after the fight. One of Langfords most famous victories was over Jack Johnson, who outweighed him by a stone and a half, in 1906, but when Johnson won the world heavyweight title from Tommy Burns in 1908 he wanted no part of Langford. Langford twice knocked out Fireman Flynn, who fought both Johnson and Burns in title fights.He also gave world middleweight champion Stanley Ketchel nightmares in a six round no decision, but never got a title fight. He made short work of Philadelphia Jack O;Brien, knocking the former light heavyweight champion out in five rounds.The truth was that Langford was to good for his own good.If he was around today he would of probably won a plethora of world titles.Sam had 167 wins 38 defeats and 37 draws.He could of won more bouts but it would of done him no favours beating all the best guys fight after fight, after all he needed to fight to have work. 'There was one man I would never fight', said Jack Dempsey in his retirement years, and that was Sam Langford.He was smaller than me but I knew he would flatten me if we ever met"
Sam was right because he knocked out Hague with a terrific right to the chin in the 4th round.He also hated underhandedness.On one occasion an opponent landed a sneak blow just before the bell ended the first round. when they commenced the second round Langford touched gloves with his opponent the traditional way to start the final round.'Mr. Langford this isn't the last round, 'It is for you boy' Sam said and proceeded to land a peach of a left hook that laid his man flat out on his back. Langford retired at the age of 43 in 1926.He had spent his final years in the ring troubled with eyesight problems.It was the commissions that ruled him out in the end, despite his protests saying he could see. Sam eventually went totally blind and living destitute until a New York reporter named Al Laney discoverd him in a cheap motel in Harlem in 1944.Laney highlighted Sams plight and established a fund that allowed the old boxer to move back to his home town of Boston where he lived modestly but happily on the funds monthly interest.He passed away in a nursing home in January 1956 two months short of his seventieth birthday. He was inducted into the IBHOF in 1990, a great tribute to a great fighter.